Bcl-2 proteins have emerged as critical regulators of intracellular Ca2+ dynamics by directly targeting and inhibiting the IP3 receptor (IP3R), a major intracellular Ca2+-release channel. Here, we demonstrate that such inhibition occurs under conditions of basal, but not high IP3R activity, since overexpressed and purified Bcl-2 (or its BH4 domain) can inhibit IP3R function provoked by low concentration of agonist or IP3, while fails to attenuate against high concentration of agonist or IP3. Surprisingly, Bcl-2 remained capable of inhibiting IP3R1 channels lacking the residues encompassing the previously identified Bcl-2-binding site (a.a. 1380–1408) located in the ARM2 domain, part of the modulatory region. 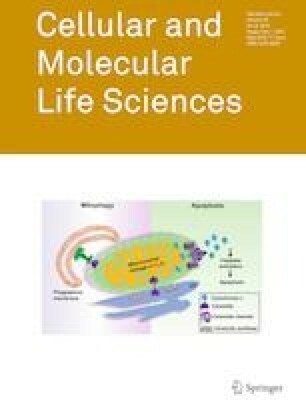 Using a plethora of computational, biochemical and biophysical methods, we demonstrate that Bcl-2 and more particularly its BH4 domain bind to the ligand-binding domain (LBD) of IP3R1. In line with this finding, the interaction between the LBD and Bcl-2 (or its BH4 domain) was sensitive to IP3 and adenophostin A, ligands of the IP3R. Vice versa, the BH4 domain of Bcl-2 counteracted the binding of IP3 to the LBD. Collectively, our work reveals a novel mechanism by which Bcl-2 influences IP3R activity at the level of the LBD. This allows for exquisite modulation of Bcl-2’s inhibitory properties on IP3Rs that is tunable to the level of IP3 signaling in cells. The online version of this article ( https://doi.org/10.1007/s00018-019-03091-8) contains supplementary material, which is available to authorized users. The authors thank Anja Florizoone and Marina Crabbé for the excellent technical help. The authors are very grateful to Dr. Colin W. Taylor and Dr. Vera Konieczny (Department of Pharmacology, University of Cambridge, England, UK) and to Dr. Llewelyn Roderick (Department of Cardiovascular Sciences, KU Leuven, Belgium) for their assistance in preliminary work. The authors thank all members of the Lab. Molecular and Cellular Signaling in Leuven and Clark W. Distelhorst (Case Western Reserve University, Cleveland OH) for fruitful discussions. The work was supported by Grants from the Research Foundation-Flanders (FWO Grants 6.057.12, G.0819.13, G.0C91.14, G.0A34.16, G.0901.18), by the Research Council of the KU Leuven (OT Grant 14/101) and by the Interuniversity Attraction Poles Program (Belgian Science Policy; IAP-P7/13). GB, JBP and DIY are partners of the FWO Scientific Research Network (CaSign W0.019.17N). HI and EV are recipients of post-doctoral fellowships of the FWO. HI was supported by a mobility Grant from the FWO for a stay in the team of Dr. Yule (Rochester University, NY).